Thought you might get a kick out of this one. I'm doubtful that the Canadian code allows for wire to be buried in concrete, sans conduit, especially in a very very damp location (Vancouver, Canada). It makes you wonder what the rest of the cable looks like, inside the concrete. The chemicals in concrete aren't usually that kind to PVC. I've never heard that before. The most common underground installation in my area is concrete encased PVC conduit. The type of PVC that is used for rigid conduit, is an un-plasticised version of Poly-Vinyl-Chloride. The type used for wires and cables has a plasticiser added to it, to make it more flexible. It is this plasticiser, that the acidic content of the concrete reacts with. 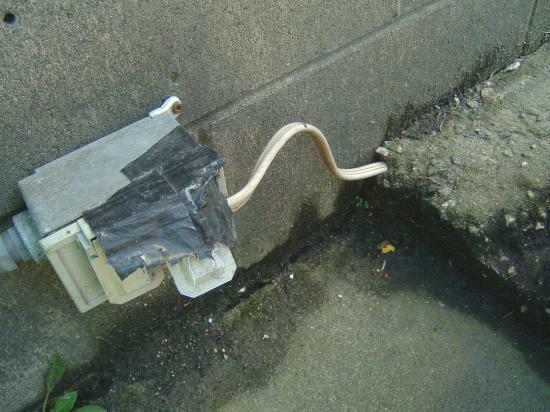 There are also forms of plasticiser that react with sunlight too and some overhead lines here have been known to lose thier insulation. Nice custom in-use cover also! All the conduit is for in concrete is a raceway,if after the cement sets the conduit rots away or disintegrates no matter you have the channel and you must pull a ground. A guy from germany once told me the Mexican way of resi wiring. Put a greased garden hose into the concrete walls while pouring them. After it's set pull out hose and reuse. Then pull THHN into the resulting cavity. No ground, just a jumper wire N-G at every receptacle.